The medical community has been warning us about the possibility of a pandemic involving the bird flu virus, but other than stocking up on the drug Tamiflu, there's not much else being offered as preventative measures. But now South Korean firm LG Electronics is poised to start marketing an air conditioner with a filter made from the pungent national dish kimchi that is aimed at protecting against the bird flu virus. Kimchi, typically made from pickled radish or cabbage packed with garlic, ginger and hot peppers, is renowned for its supposed health benefits — as well as its powerful odor and taste that has prompted much mouth-fanning and even profuse sweating among those who've tried the spicy slaw. "We developed the filter with the aim of protecting people against bird flu," said LG spokeswoman Park Se-won, citing four studies from domestic and overseas institutions that she said showed the filter eliminated the deadly H5N1 virus associated with bird flu. Over the years, kimchi has frequently been billed, particularly in Korean culture, as a miracle food with an amazing array of health benefits. 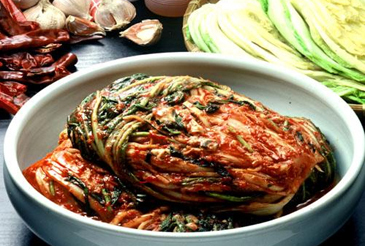 During the SARS crisis in 2003, many Koreans believed eating kimchi helped ward off the disease. LG, which is the world's largest manufacturer of air conditioners, intends to start marketing the kimchi-infused air conditioners in China and Southeast Asia soon. But the LG spokesperson was quick to note the appliances would not transmit the unmistakable kimchi smell through rooms. "Since the filters are made with only the enzyme extracted from kimchi, the smell doesn't follow." Too bad. We were hoping for a whole line of hot-food air conditioners like Tex-Mex Chilly and Ragin' Cajun Cooling. The above article is from MSNBC.